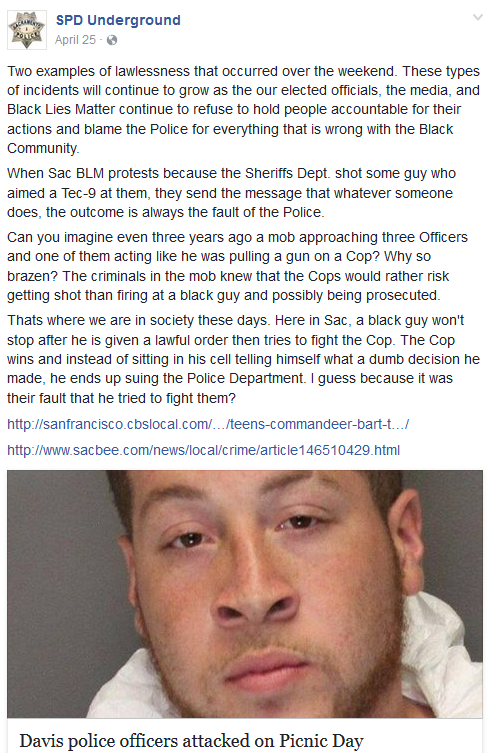 The Sacramento Police Department has taken to Facebook to show its true feelings amidst ongoing controversy on a page known only as “SPD Underground.” The page moderator (whose name and position within SacPD remains unknown) seems to have several axes to grind, as they single out several people by name, including the Sacramento Bee’s Anita Chabria and Black Lives Matter’s Tanya Faison. 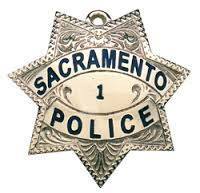 The page claims to be: “The unofficial voice to the hardworking men and women of the Sacramento Police Department,” however, its authenticity has been unverified. The page’s numerous posts railed against anti-police sentiment, refuted claims of police brutality, and overwhelmingly sought to deny any racial bias within the police force. They continuously refer to BLM as “Black Lies Matter,” and called its followers “ignorant,” among other things. With a meager 270 likes, the page does not appear to have attracted a sea of supporters. 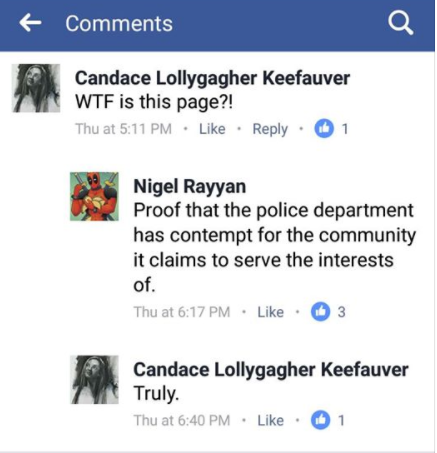 In fact, many are questioning the professionalism of the page, as the clear grudge against BLM supporters have raised concerns that police have openly admitted hate for the very communities they’re sworn to protect. General insensitivity has also been a point of contention. As the previous excerpt showcases, the SPD moderator accuses Mikel McIntyre’s mother of wanting to profit financially off his death. This comment was made in the recent aftermath of his shooting, as she was still mourning the loss of her son. 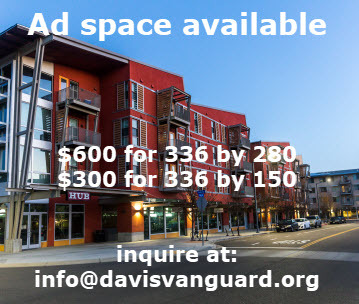 The page vows to continue its uncensored rants and keep the page public, as well as swears to bring down the Sacramento Bee and remain at war with the local BLM chapter. We will wait to pass judgement on the videos that were released and we should remind everyone else especially BLM and our City Leaders to do the same. Let’s not forget Ferguson where people made up their own facts and when the evidence came out it didn’t matter any more because it didn’t fit the narrative. Thats why we still have BLM protesters walking around showing their ignorance by chanting “Hands up don’t shoot”. What’s there to argue with here? That was I believe in response to the Nandi Cain situation where there was a video – unlike Ferguson. 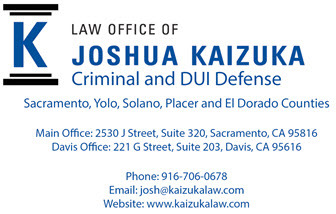 It’s reasonable to argue for withholding judgment when there is no video. We all saw the Cain video, even SPD came out with a quick denunciation, so in this case, I think their view is arguable at best. That said, that’s probably the most innocuous of their posts. I find all of the examples quoted here in this article as fairly innocuous. 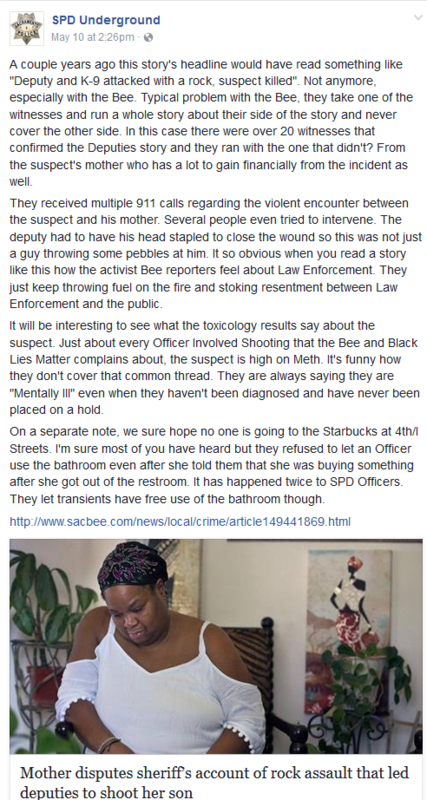 The Sac PD page is tame compared to most cop blogs. Cops have killed 503 people in the USA so far in 2017. 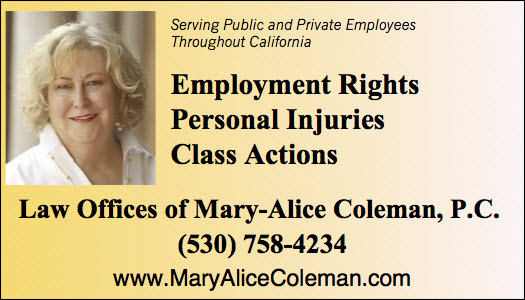 We overpay them for this disservice. They are the deadliest gang in America. Only ignorant in their hopefulness that some humanity exists within the ranks of the police force.